Paul Gauguin was introduced to the British public through a ground-breaking exhibition organized by art critic, Roger Fry. 46 of Gauguin’s works were exhibited, more than any other artist, and one of his works was selected to be on the poster to advertise the exhibition. The First Post-Impressionist Exhibition, Manet and the Post-Impressionists, ran from November 8 – January 15, 1910 and was focused on the works of Van Gogh, Cezanne and Gauguin while also creating a connection between the art of Manet through to the most recent post-impressionist artists in the exhibition, Matisse and Picasso. The works of Impressionists such as Monet and Renoir was still something the art world was trying to wrap its mind around so the 1910 Post-Impressionist exhibition which suggested that Impressionism was already a thing of the past was baffling to many. Some visitors, as well as art critics, believed that the exhibition was a hoax and others that it was an offense to English culture. Impressionist and Post-Impressionist art had appeared in France over thirty years earlier but England was still not ready for such modern art. The exhibition was modern and primitive to the British. 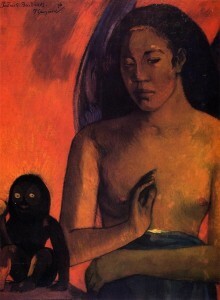 Gauguin’s Tahitian phase was on full view with his depiction of a “native” woman posed next to a Tahitian statue as the exhibition poster. His works, fairly realistic, were widely accepted by the public.